Yesterday was a big day on the retaining wall. We started it waiting for twenty more concrete posts to be delivered. They came just before 9:00am. We then completed the last three wall panels on the west boundary. As a precaution we braced the wall where we had used the fence posts for supports ahead of back-filling. First component of the back fill was all of the old fence posts and rough rocks and other hard debris. Then a large load of tennis ball sized rocks was delivered. All hands on deck to barrow those from the front of the house to the wall. They comprise a layer about 40-60 cm deep and 50 cm width from the inside wall side. It will be this layer that I direct excess water runoff into the wall so it seeps under it and into the existing natural depression on the adjacent land to the west of us. About 1:30pm a tractor arrived and over the course of an hour pushed all of the dirt/rock fill back into place and leveled up the back yard. He also shaped the west boundary from the end of the wall to the concrete side fence. (He also pushed a truck load of fill from the front yard to the northern end of the eastern boundary. We are now all set to get quotes on the two meter metal fence that will enclose the back yard.) I was filthy and buggered by the end of the day and slept rather well last night. Here is a view of the retaining wall corner from level 2. The metal fence will track just inside of the wall along the west and north boundaries. 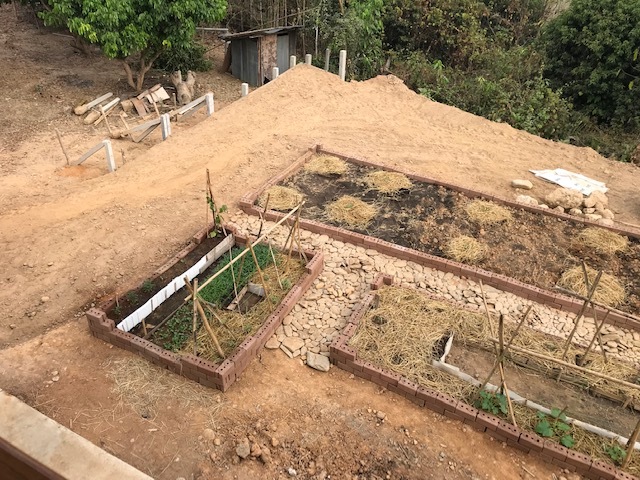 You can also see the progress on our vegetable gardens. 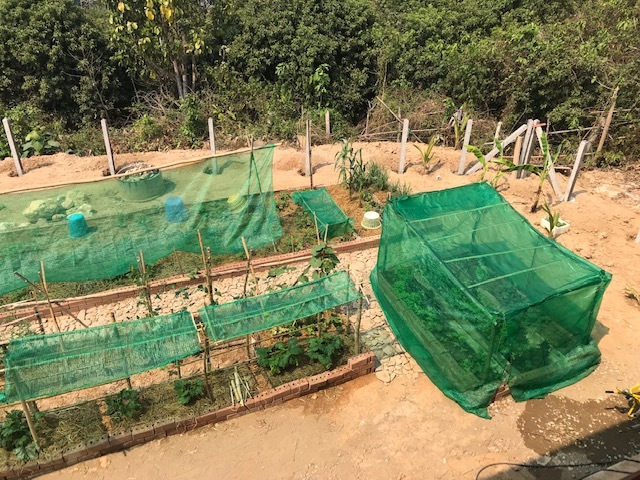 In addition to the lettuce that we cannot keep eating enough of, we've got zucchini, beans, tomatoes, bok choy and morning glory established and expect we will be harvesting some produce from them by the end of the month. 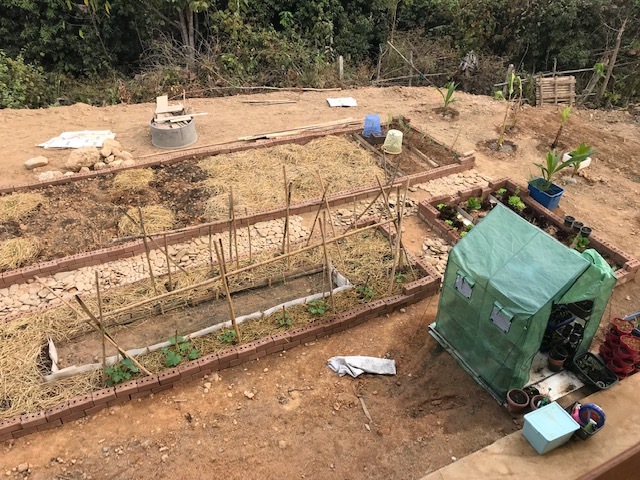 Also in both photos you can see we've collected an enormous number of flat round stones and are using them to provide a path between the vegetable gardens. 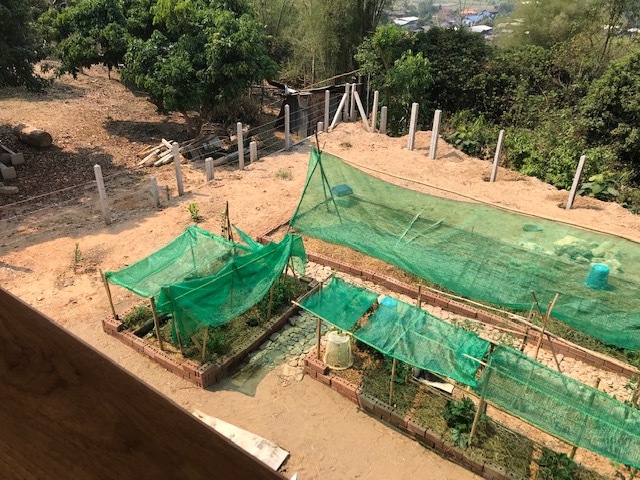 On the outside of the vegetable gardens (and elsewhere in the back and front yards) we intend to establish some sod ahead of the wet season. Last edited by BoganInParasite; 07-03-2019 at 01:48 PM. 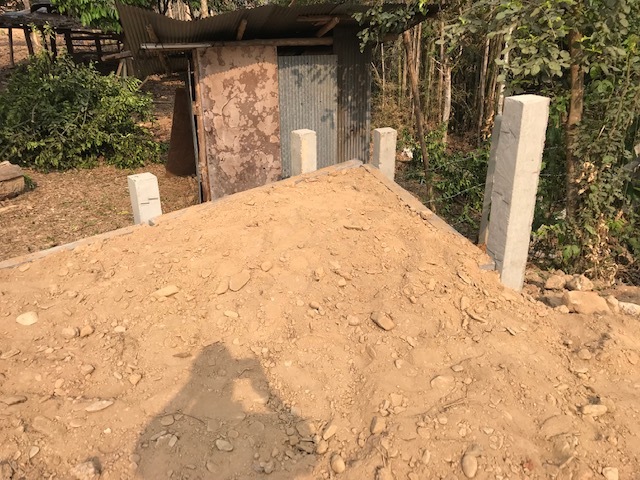 It will be this layer that I direct excess water runoff into the wall so it seeps under it and into the existing natural depression on the adjacent land to the west of us. 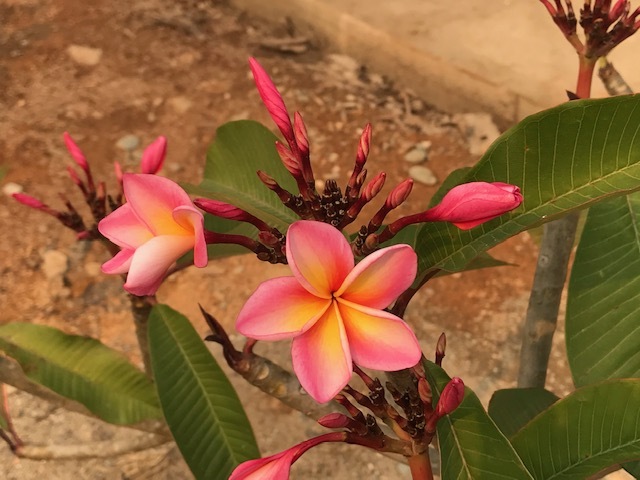 Got our first frangipani flower. So far we've planted white, pink and red frangipanis and are looking for a yellow and multi-colour. Our plans for a two meter high metal fence around the sides (from adjacent the front of the house) and back yard have come to a screaming halt. We've been unable to find anyone to do it. The company we were going to use that says they cover the whole of Thailand (via sub-contractors) is not interested in the job. No explanation despite our asking. Other locals don't have the experience and we can't find suitable metal sheets and rails. 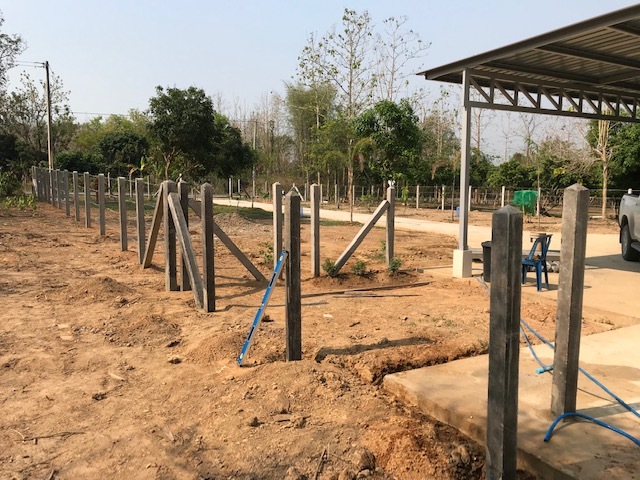 Eighty meters of fence would have been a job in the vicinity of 90-120,000 baht, a reasonably worthwhile job we thought. The ground is level and there were no complexities. 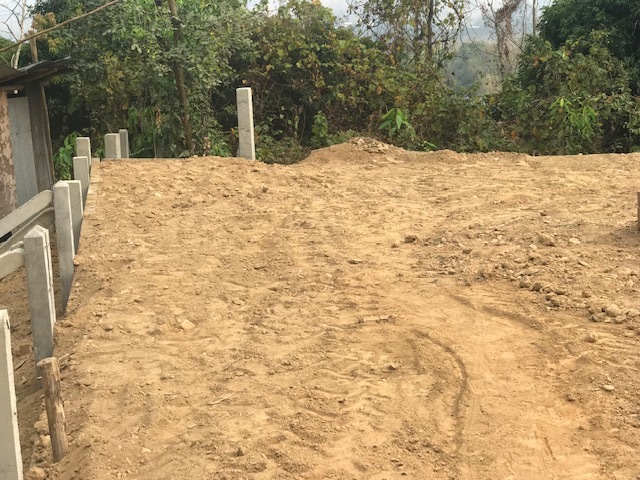 The wife and I discussed at length and have decided to revert to a fence we were seriously considering early on in the build. 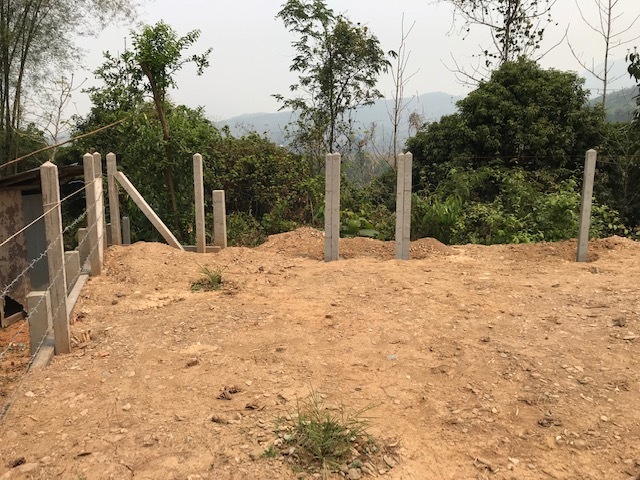 We are going to concrete in two meter concrete posts and string it with two barbed wires in positions 1 and 2 at the top and four solid steel wires in the bottom four positions. We'll then fix one meter high 1 cm square steel mesh to the fence with approximately 10 cm in the ground. 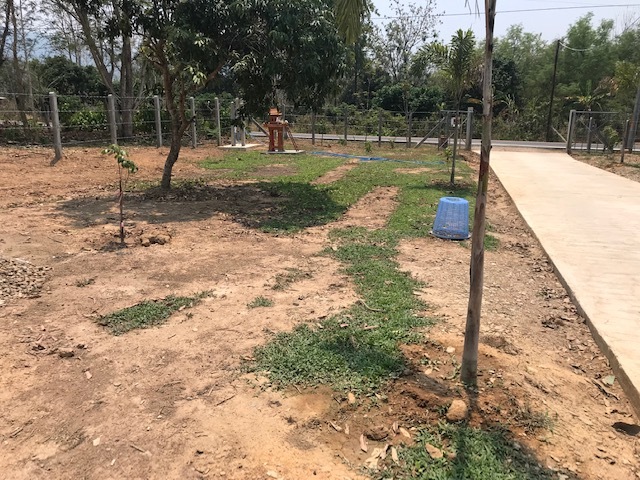 Inside of the fence and planted at 20-30 cm intervals will be a tree (more a large bush really) that grows vertically with no substantial side branches. We will shape these to eventually form a hedge effect. This fence will keep the bulk of the nasties out in regards to snakes and scorpions. It certainly won't stop 100% of them, but few fences will. If we were to pay local labour the whole thing will cost about 40,000 baht including the trees. 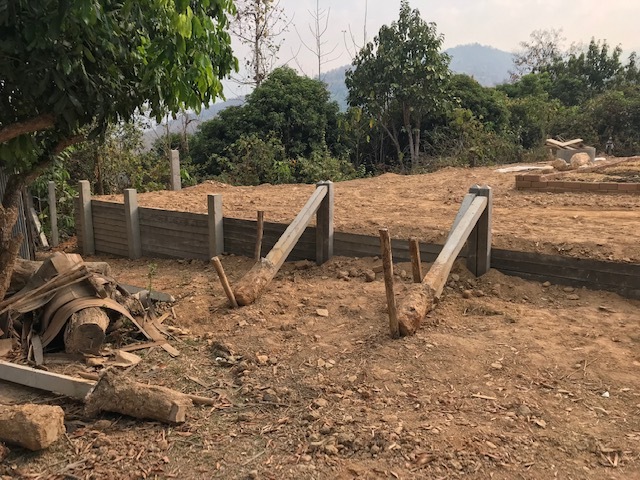 However because I let our local labour go (and following an incident involving one of the neighbours cows grazing in the vegetable patch) the wife and I have embarked on building the west boundary fence to keep the cows out. 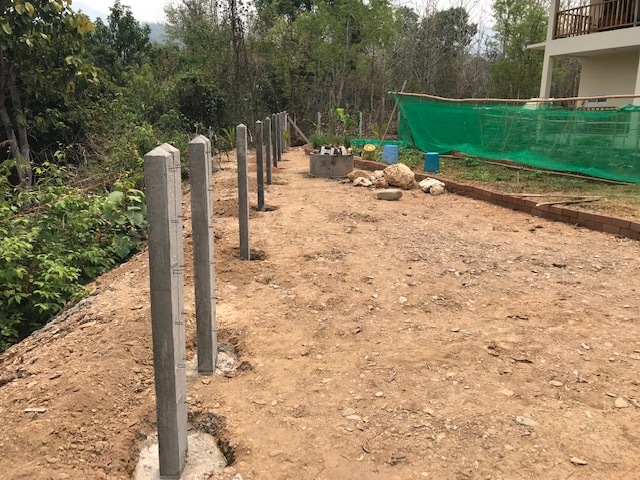 Been very heavy labouring the last several days including hand mixing batches of concrete for the posts. Been fourty years since I've made concrete from scratch. I had to look up the ratio of cement, sand and metal/gravel. Volume of water is by feel, need something that will flow into the post holes and really set them in hard. 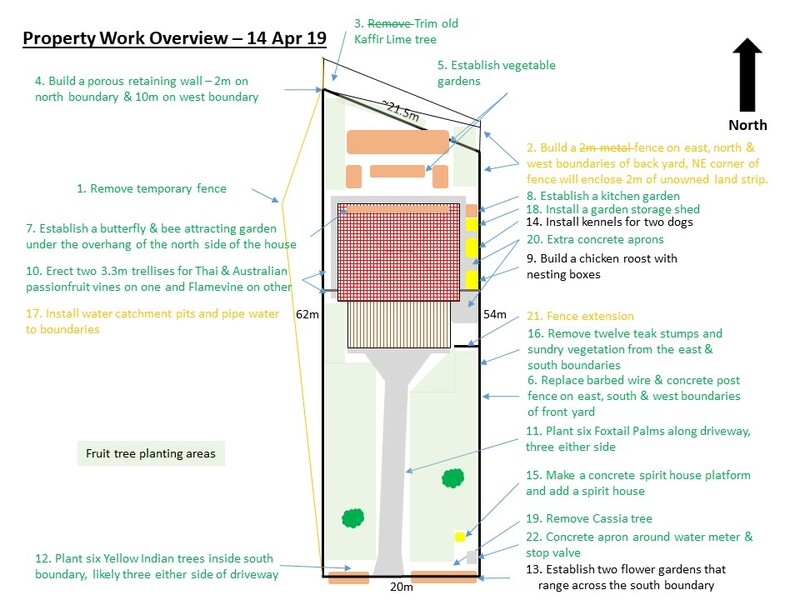 I'm heading to Australia on Monday so we need to get the back west boundary fence (sans trees) done by Sunday. Will post some photos. Can't find the wife at the moment so unable to say what trees we are looking at for the fence. Apparently she is considering two kinds, one is Australian. So I finally tracked down the wife. 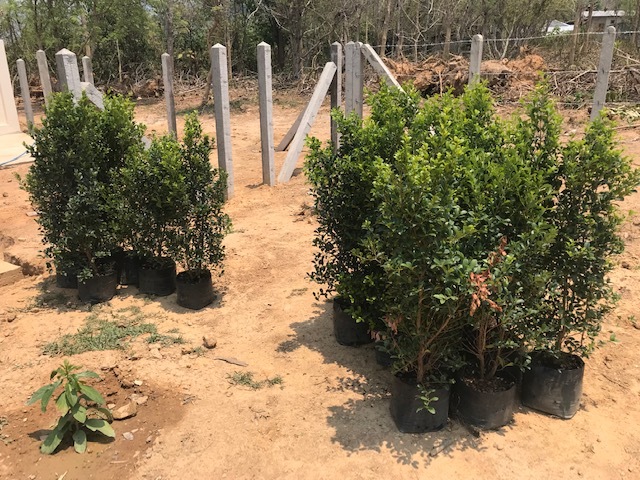 Fence plant hedge options she was looking at were Banyan Tree (ficus annulata) known in Thailand as Sai Korean or the Australian/Indonesian Cedar Bay Cherry (eugenia reinwardtiana). Spent a bit of time researching them last evening. Experimenting with the fruit of the Cedar Bay Cherry is tempting and it is an interesting looking plant but it seems to be the Sai Korean is a better and more common hedge plant. Anyone got any experience with the above or other suggestions for a hedge plant? Last edited by BoganInParasite; 15-03-2019 at 12:36 PM. it seems to be the Sai Korean is a better and more common hedge plant. Isn't there the risk that it spreads too much and gets out of control? as it grows older it sends down aerial roots which, when they reach the ground quickly form roots and become much thicker and more vigorous. I am guessing things are moving along nicely in the garden and I am looking for inspiration for when I get back to ours next week. Will post later today TD. Went to Aus for a couple of weeks to see my elderly parents and welcome a new grandchild. Been back two weeks but as it is hot now the the wife and I are only working in the mornings. 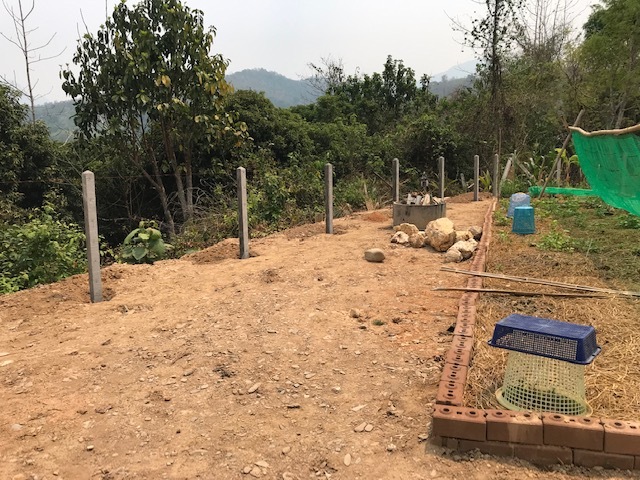 We've got all of the concrete posts cemented in for all of the fences and I'm about to dig the trenches for 140 meters of drains. More this afternoon. Been a while since I did a substantive update. Went to Australia for the second half of March and have been quite busy since getting back 14 days ago. It is hot now and the wife and I tend to work in the mornings before cleaning up and retiring to our bedroom retreat and throwing on the aircon. We emerge again towards sunset to water the vegetable gardens, trees and some grass we are trying to encourage. 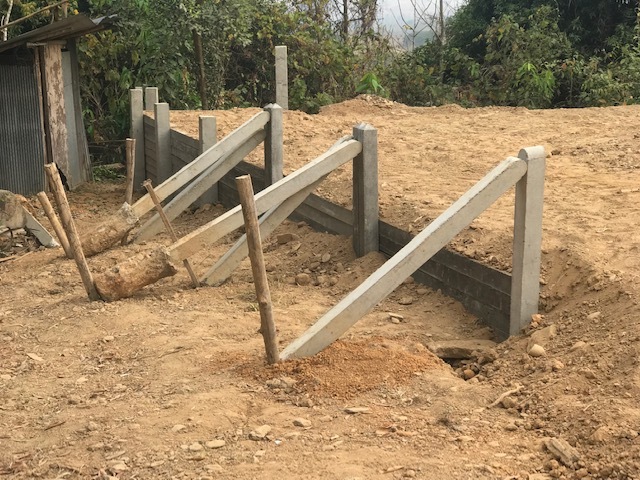 Our main activity over the past two weeks was to dig holes and concrete in fifty one concrete fence posts for the side and back fences. This has been heavy work and there have been a few times we almost decided to go back to hiring local labour to help us but we got it done and am enjoying a sense of achievement. 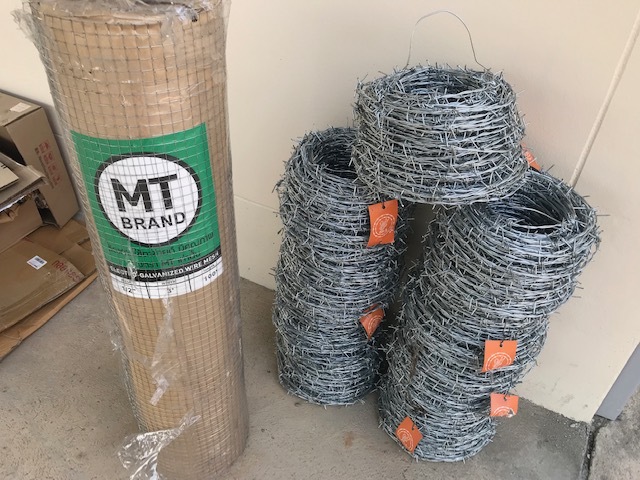 Our next steps on the side/back fences is to string six lines of barbed wire, then attach a metal mesh to the bottom half and into approx 100mm of underground. 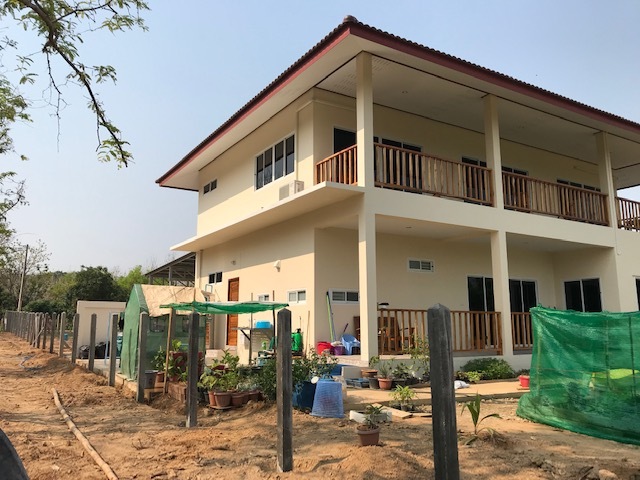 I've found some reasonable quality mesh but still expect that it will only last 2-3 years before needing to be replaced at a cost of 3,000 baht for the whole back yard. Inside of the yard and adjacent the fence line we are going to plant several hundred plants that will eventually form a hedge. The vegetable gardens have had mixed results. Mostly good though. The bad points are it appears our soil may be lacking some trace elements and a few vegetables have been lost to pests. So far we've eaten six varieties of lettuce and a few cucumbers. We have corn, zucchini, tomatoes, spinach and beans close to picking. And lemongrass, rosemary, mint, celery and rhubarb also going well. The butterfly and bee garden is full of flowers and attracting native bees. Not a single butterfly yet. 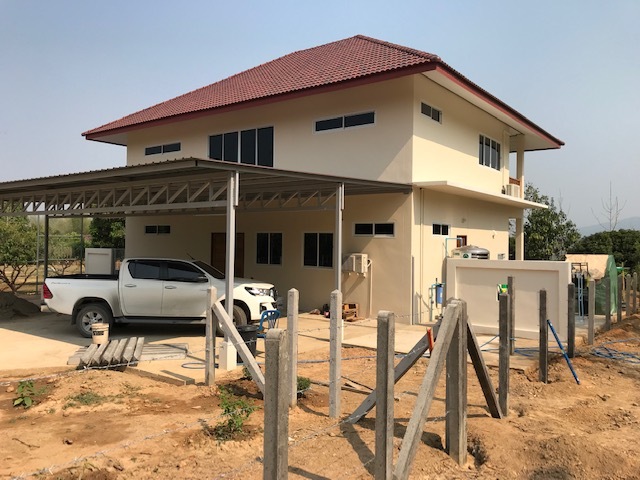 However the wife has pushed me out of that garden in a series of little moves ('I only want to help...') that has clearly demonstrated the superior ability of Thai's to encroach on real estate. But it is looking good. She has added some English garden style plants including hydrangeas which she quite likes. Last edited by BoganInParasite; 14-04-2019 at 06:46 PM. While I was in Australia our home and nearby area experienced an intense but quite short storm. Lot of wind and rain. Speaking to the wife and a farang friend I'd say it was a classic micro-burst. It blew the roof off our neighbours toilet and in the case of a house being built and with no windows yet installed, blew the room ceilings out. When I got back I was able to trace where the rain water flowed on our property, particularly where it went. It mostly validated my previous ideas of collection and distribution points. However what I did see was I needed much more collection points than a small number of sumps would provide. So I've switched to using french drains for collection and a modified french drain for distribution at two points on our boundary, including the retaining wall in the north west corner. All up I'll be installing approximately 150 meters of drains, all dug by hand. 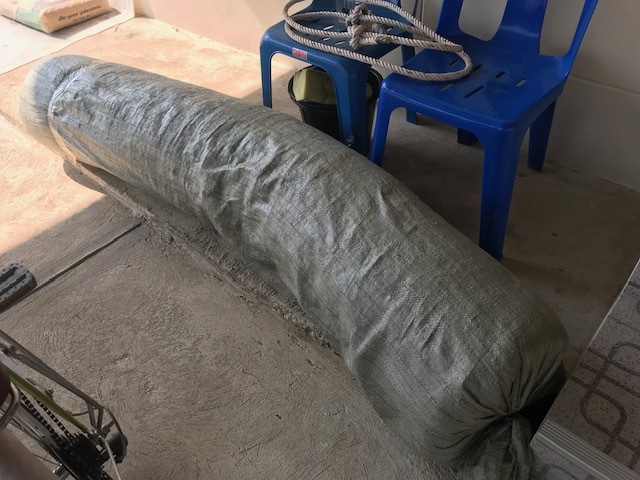 I was able to find some geotextile fabric in Thailand and was amazed to have the 140 sqm I ordered online delivered only two days later. I'll be using medium thickness 80mm pipes and will unfortunately have to hand drill those pipes to be used in the collection and distribution portions of the drain. The other component of the drain is going to be a lot of relatively clean (and preferably rounded) gravel up to plum sized pieces. Have no idea how much I'll need but we have a local guy here who can deliver up to two tonnes within a couple of hours of us (well, the wife) calling him. 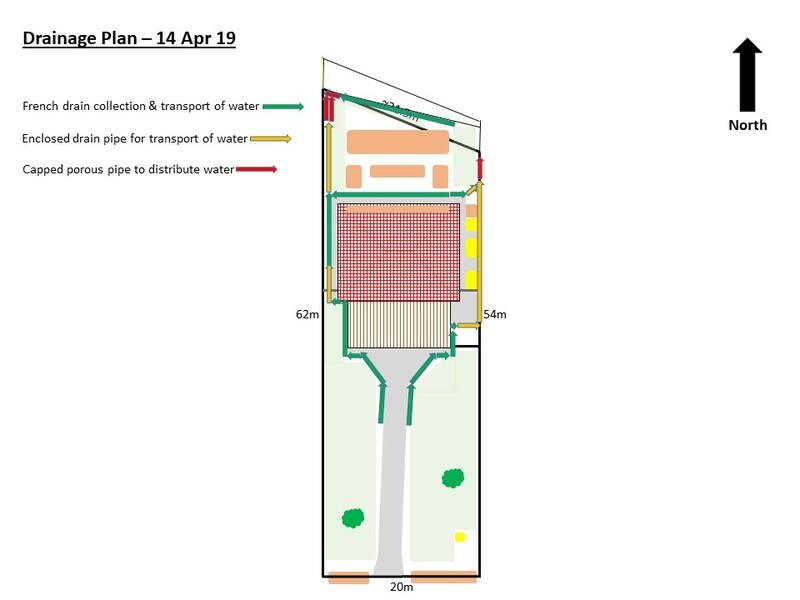 Below is our very high level drainage plan. Building the back east boundary fence. Various views of the north boundary fence line. Still have to add the barbed wire, drains and plants. Back yard views from the level 2 covered deck. We put another concrete apron on the east boundary in front of the house. It will be for washing motor cycles. 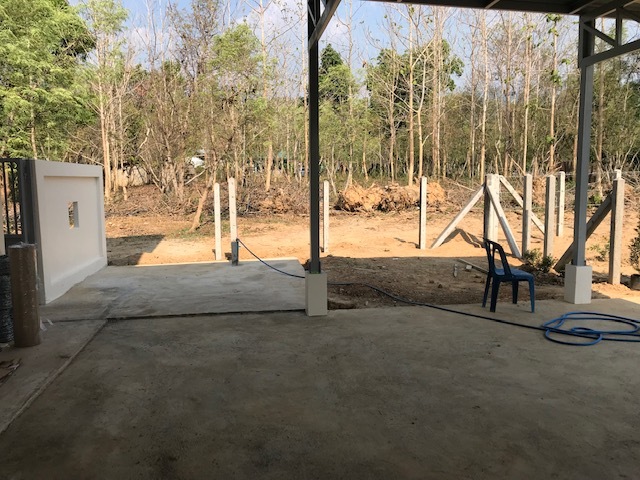 The area to the right of it will be enclosed on two sides by hedge covered fences and will be an outdoor relaxation/BBQ area. In the hot and wet months it is shaded by the house and/or carport from mid-afternoon. If it is raining then the BBQ and outdoor furniture can be moved under the carport. We've been encouraging some of the better grasses to regrow in the front yard. Now getting some success. But will not be disappointed when the wet season arrived. Currently the wife and I are spending at least forty minutes each morning and evening to water everything. The metal mesh to be used on the side and back fences. 140 sqm of geotextile fabric for the drains. The initial hedging plants. Got them today. The nursery gent said they are Australian plants (so obviously top class). Pretty sure they are Cedar Bay Cherry (eugenia reinwardtiana). 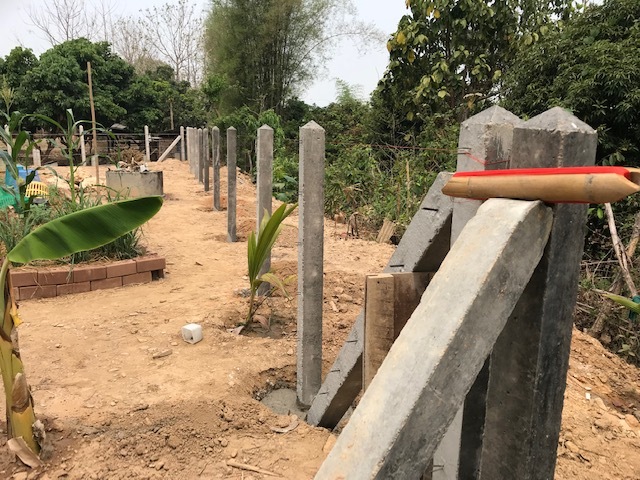 These cost 115 baht each so we'll be buying much smaller and cheaper for the rest of the fences. We wanted these more advanced plants for the outdoor BBQ/relaxation area. The butterfly and bee garden is full of flowers and attracting native bees. Not a single butterfly yet. However the wife ... has added some English garden style plants including hydrangeas which she quite likes. That's an interesting and good idea. What plants have you planted so far to attract butterflies? And what other plants do you plan on getting to attract butterflies?